Android 9 Pie... Do you like it? Disappoint, My Pixel gets hot, battery drain so fast. I'm not a fan of the new UI with all these rounded corners and app icons. But the new notification channel system is a good feature though. I 💓 the BlackBerry keyboard. Best virtual keyboard hands down! Yes, i really liked Android 9 Pie. it's working Very smooth and Battery life is better. i don't faced any problems yet. Pie battery life can be extended by 50% by turning wifi scanning off. Gillysixpence and Sedp23 like this. Brilliant thanks, my hubby was having this issue on his OnePlus6. I've passed it along. Have you tried setting your actual 'device' language to UK US. I had to do that to get multiple voices for assistant. I also can't grab text from the recents, also UK. So far I'm really liking it. I'm trying the gestures out which are much easier to use that I expected, having never used them before. I like the volume button changes as far as the profile switcher but would prefer to have the ringer as the default I think, I feel I'd use that more, so hope that will be implemented. I much prefer the recents tiles this way but would love to have the live copy/paste option in them on my P20. Not sure if that is phone specific or not but I think it may be. I also seem to be able to do more from the lock screen notifications whereas before I couldn't do anything at all without unlocking. I'm happy with that as I can do what I need to without compromising the security of my messages etc. I've left location on as usual but have toggled off the blue tooth and wifi scanning as I really don't need that on all the time and would rather have excellent battery. As far as battery I've only had it since yesterday afternoon so am watching to see how it behaves, hoping it'll be as good as Oreo or better once it learns how I use my phone as I'm so super impressed with battery on this phone. I have liked it since the first beta on through. Works fine for me. I should mention a terrible battery drain the first three days that I'm sure had nothing to do with being on the damn phone 23 hours a day. I've had it for a few days and - mostly - I like it. In the UK I don't (yet) get a choice of more than 2 Assistant voices or the ability to grab text from the Overview menu, however, I'm sure it'll cross the pond eventually. I like the Gestures and the Auto-rotate changes. Hello, overall I like it. Just have an annoying feature I can't seem to turn off. Some apps have a pop up icon like the one messenger have when someone texts you. Anyone knows how to turn it off? Overall its a bit worse than Oreo. 2. Battery life just as good as Oreo. 2. Adaptive brightness - Turned off after couple of days, never adapts, never been a fan of auto brightness. 3. Aggressive memory management - Much worse than oreo even with adaptive battery disabled. Kills background apps much faster than Oreo. 1. Gestures - i don't use it, i have Nova launcher which has gestures and i have Moto one button nav using the fingerprint sensor so i dont need anything else. Flashed my Note 9 a few days ago with Pie. So far so good. Great battery life and smooth. Really liking the software. UK and using EE. Hate it, not just because of the looks but because it's a PITA. It changed a bunch of settings, I had to re-download my entire Spotify collection for some unknown reason, lock screen notifications don't show properly and I've now got a permanent notification telling me that Locale has switched off my Bluetooth, which I can't get rid of, and I use Locale constantly to manage my settings. Notifications should be MY CHOICE. It's MY PHONE which I PAID A LOT OF MONEY FOR. So minimize or disable the notification? I want control over my phone, that's why I use Android. I feel like I'm using iOS at the moment. Not so far. Too many changes. A lot of text I can't see. I can't see my calendar at all. So now we seem to have two different types of threads happening in this thread. We have do you like Android Pie, and we have do you like the bastardization, or implementation if you will, of Android Pie that the oems are releasing. I honestly can say I absolutely hate it. (default) Text size is way to big, maybe handy in 40 years time, but for now I can read just fine thank you. Luckily that is an easy fix. Basically all the UI has overly rounded edges and uses way to much spacing between different elements, wasting half your screen. Notifications are hidden, it only shows the icon, I have to tap it to actually see what it is about. Those particular icons are relatively small too and off in the top left making it hard to press them, especially with one hand and a big screen. Animations are way over the top and slow. Reducing them/disabling them doesn't work right either. For instance if I swipe to a different home screen it will first switch there, then instantly switch back and finally do the animation anyways... If it doesn't do that it simply performs a laggy animation or waits a while before switching to the desired screen. In the past you had the ability to change the animation speed, but that is gone now, so you are stuck with these slow animations. What was wrong with swiping to the sides to close an app in the 'recent apps' display? Very laggy. Had no problems in the past with previous android versions. Hollywoodin2001 and woolster22 like this. I hate the update ! The icons are now ugly as hell and far too big for my Galaxy S9 screen. Moreover, the colours of the icons are disgusting ! I wished I knew what this update would do before I installed it ; I'd never have installed it. Google has surpassed itself this time in terms of update's ugliness. And why does Google need so much to make updates looking like Apple OS ? We have Android system because we don't want to have an iPhone ; don't make Android phones become Apple phones !!! Hollywoodin2001 and deadbeatles like this. There are a few things I don't care for but two stick out. First, I don't like the swipe up to close on "Recent Apps". If I wanted an iPhone I would have got one. Will Google/Samsung ever stop bringing things to an Android phone from iOS that are completely useless? If you want to copy something useless copy the animation in text messages or screen record. At least they're fun while being useless. Second, I can't auto-hide the task bar like before. I'm sure I'll get used to the other things. I mean, I have to because I have no choice. lol. You can change the lock screen notifications back to normal in the lock screen menu in settings. No. For me it's an I want my money back scenario. J7 PRO 2018 HANGED already ,how could i turn it off ? or restart? 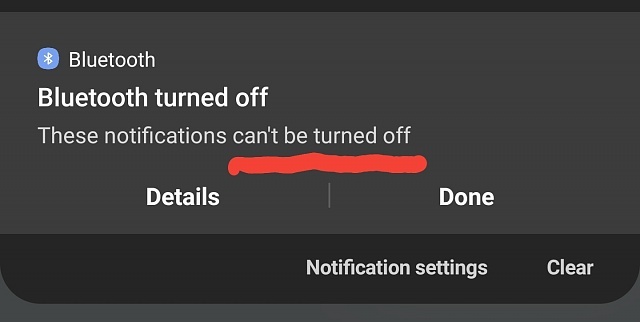 How do I turn off the light off of my phone? What do I need to download inorder to view media files on my smart tv? i inserted a new sim card into my adeoid 9s in brazil...it worked fine until this morn8 g.